The art of war in the age of the American Revolution—what American, British and European officers read—is the central theme of the Institute’s rare book collection. 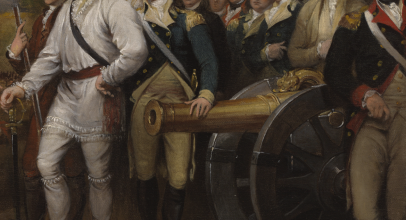 The collection reveals the evolution of the theory and practice of warfare in the Western world through the eighteenth century and provides context for understanding the achievement of the American forces and their French allies in securing the independence of the United States. The works of military art and science include drill manuals, technical and theoretical treatises, medical and mathematical texts and officers’ guides. In addition to these practical works, educated officers of the eighteenth century studied the classics of ancient Greece and Rome as well as histories and biographies of campaigns and commanders of the more recent past. A prize of the collection is a first-edition set of Diderot’s Encyclopédie, the great compendium of Enlightenment thought that includes many entries relating to the technology of war. The rare book collection, encompassing works published to 1820, also includes official publications such as acts and regulations issued by the Continental Congress and the individual states, ordonnances du roi concerning the French army and navy, and British royal acts governing the conduct of war. The library holds a nearly complete run of the annually published British army lists spanning the years 1754 to 1800. A broad range of contemporary publications present the issues and events of the Revolutionary era as they were experienced and understood by those who lived through them. Among these works are political pamphlets, histories, memoirs, sermons and periodicals. 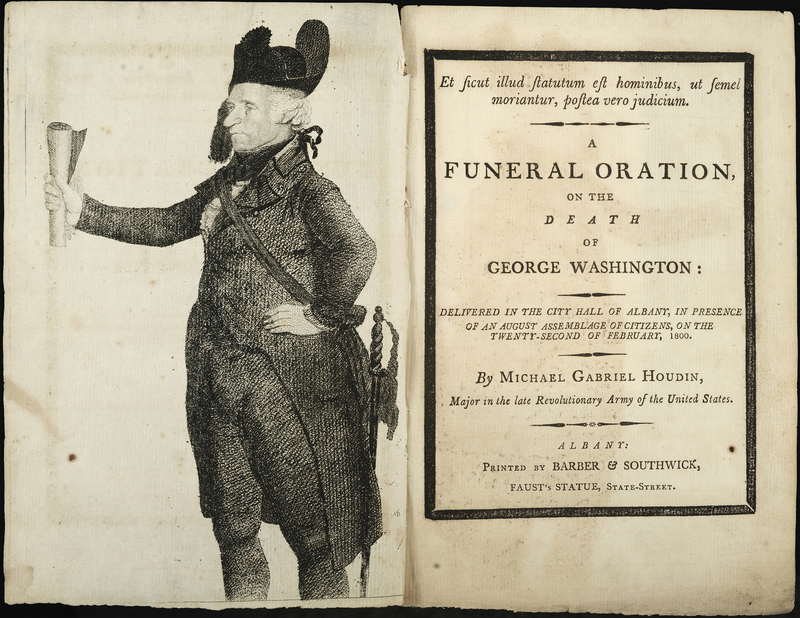 The collection contains numerous memorial tributes and funeral orations for prominent figures of the period, including more than one hundred eulogies published after the death of George Washington. The Institute also holds a comprehensive collection of publications relating to the founding and early years of the Society of the Cincinnati, including the pamphlets circulated by the Society’s critics. Dating to the fifth century, Vegetius’ writings on military matters in Rome were studied and emulated from the Middle Ages through the era of the Revolution. 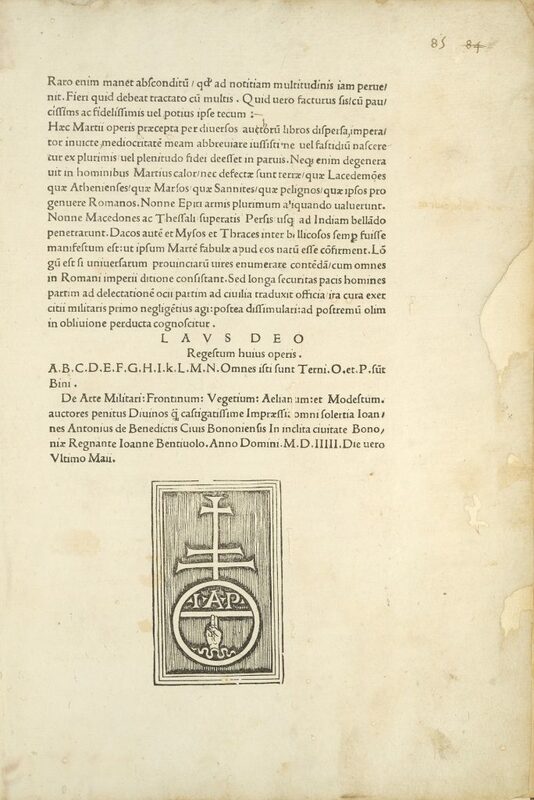 This Latin edition of 1505 is the earliest work in the Institute’s library collections and one of twenty-four editions of Vegetius’ De re Militari in various languages held. 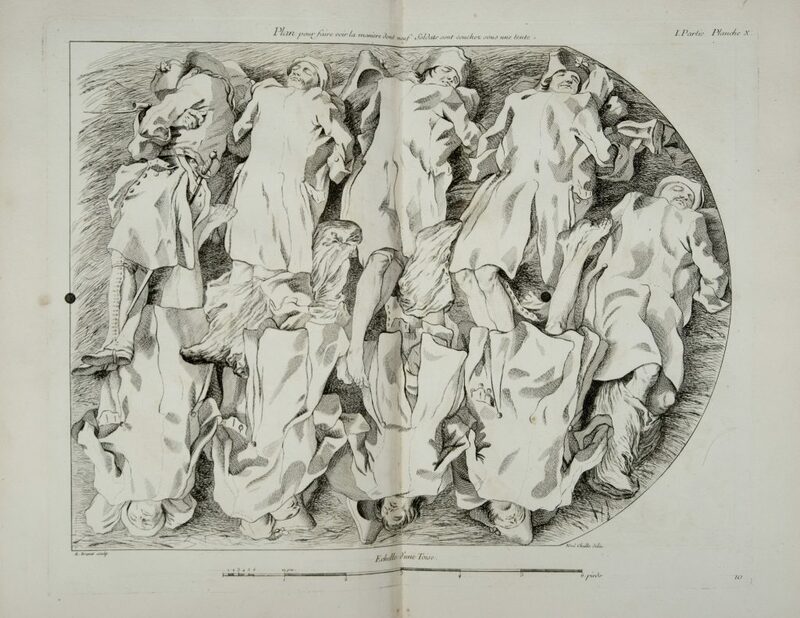 This plate from a popular French treatise on the art of war shows how to arrange nine soldiers for sleeping in a tent. 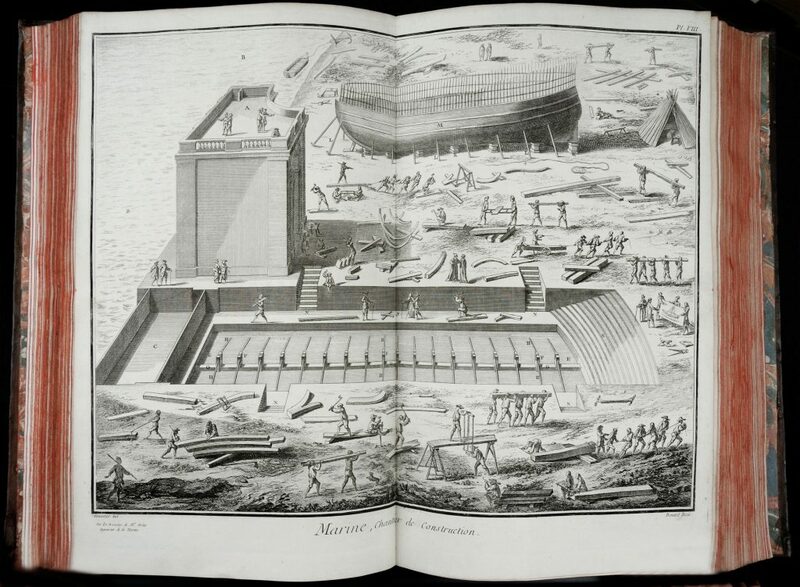 Keyed to the accompanying printed text, this plate in volume seven of Diderot’s compendium lays out in rich detail the complexity of a naval construction site. 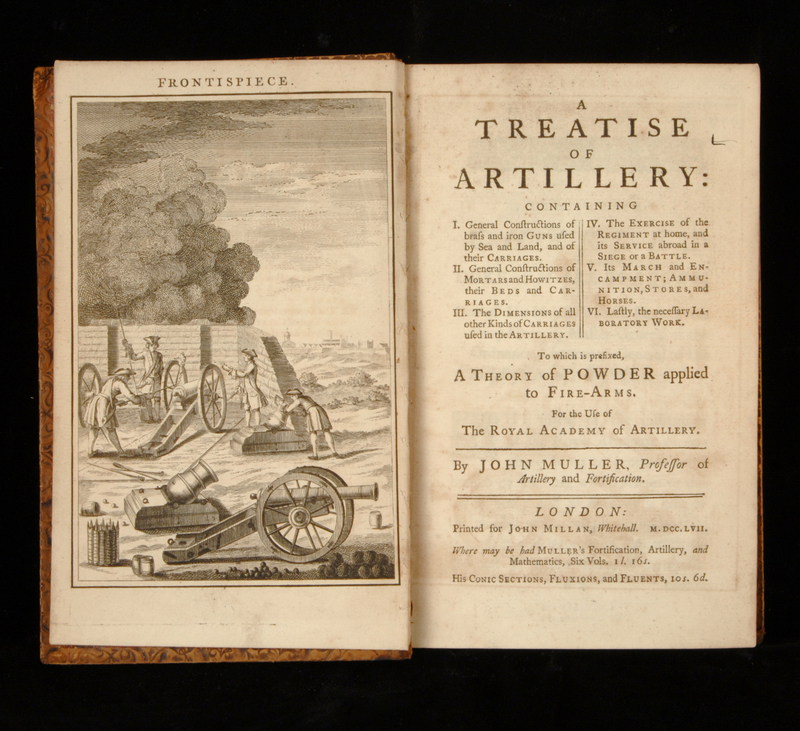 Muller’s Treatise of Artillery was the most influential work on the fabrication, management and organization of artillery in English during the era of the Revolution. 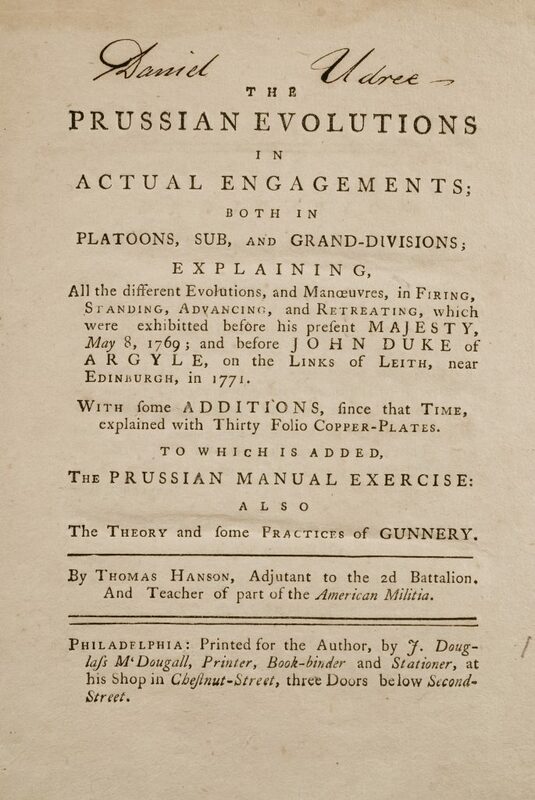 The Institute holds all three London editions (1757, 1768 and 1780), as well as a reprint published in Philadelphia in 1779 for the use of the American forces. 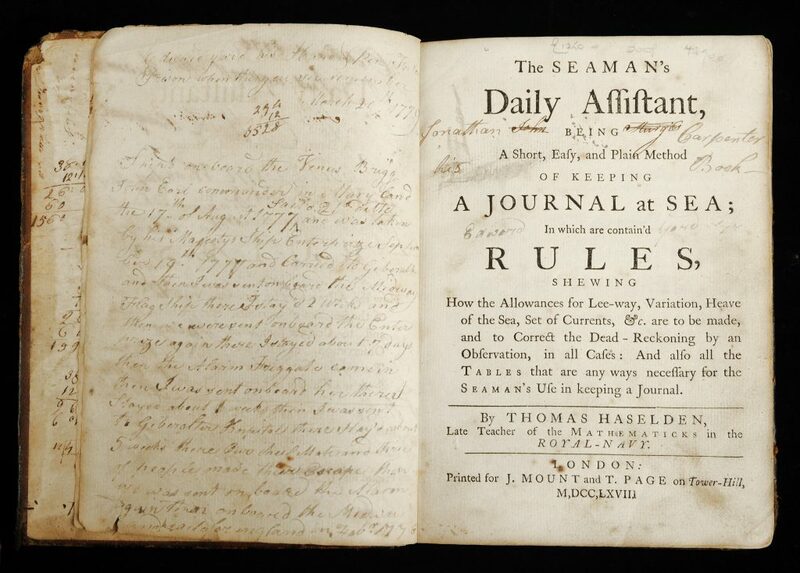 Inscriptions in this volume document the travels and travails of a succession of owners. The earliest signature indicates that the book was purchased by Abram Outten in Baltimore in 1769. The next owner was John Sturgis, who bought the book in Baltimore in 1776 and recorded in it his experiences as a privateer sailing in the West Indies. Another owner, Edward Yard, acquired the book in 1777 and in it documented his capture and transport to Forton Prison in England. While at Forton, Edward Yard sold the book to another American prisoner, Jonathan Carpenter. 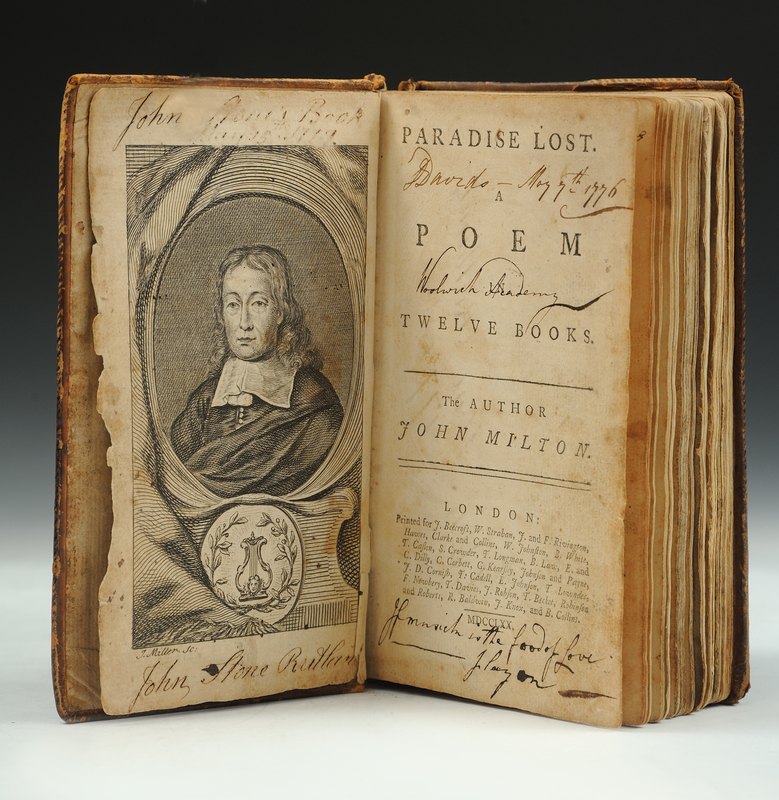 This copy of Milton’s epic poem belonged to two officers, one British and one American, who fought in the Revolutionary War. The first owner was Daniel Davids, a lieutenant in the Royal Regiment of Artillery who was taken prisoner at the Battle of Saratoga. The second owner was an American lieutenant John Stone, who served at the Rutland Barracks in Massachusetts where Davids was held. 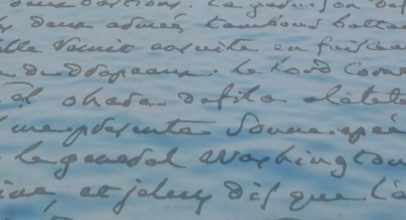 In addition to both officers’ signatures with places and dates, the book contains several literary quotations written on its title page and flyleaves. Whether the book was a spoil of war or a friendly exchange between the two soldiers is unknown. 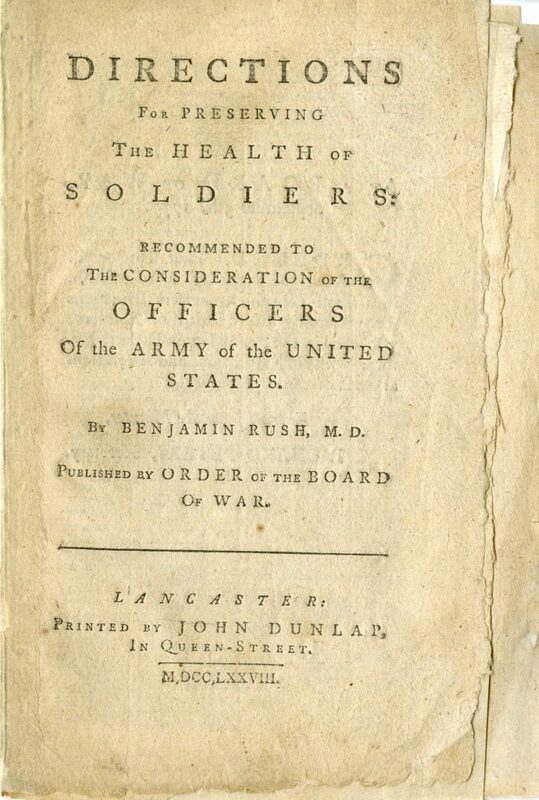 Dedicated to the “Preservers of Liberty,” this is one of the earliest military manuals published for the instruction of young American officers during the Revolutionary War. The author, an officer of the Philadelphia Associators, based his system of manual exercise on the military innovations of Frederick the Great. The five-page subscribers list is a veritable roster of prominent American patriots, including such notables as John Adams, Benjamin Franklin, John Hancock and Anthony Wayne. George Washington ordered eight copies of Hanson’s work just one month before he was appointed commander-in-chief of the American forces. 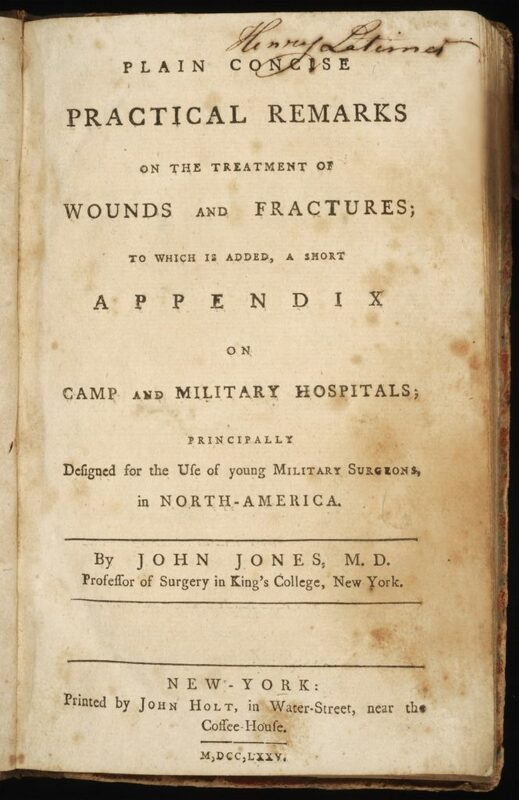 Dr. John Jones, a professor of surgery at King’s College in New York, was a veteran of the French and Indian War. His manual for military surgeons was first published in New York in 1775, and, in an expanded edition, in Philadelphia the following year. This copy belonged to Dr. Henry Latimer, who directed the Continental Army’s “Flying Hospital,” a mobile surgical unit. 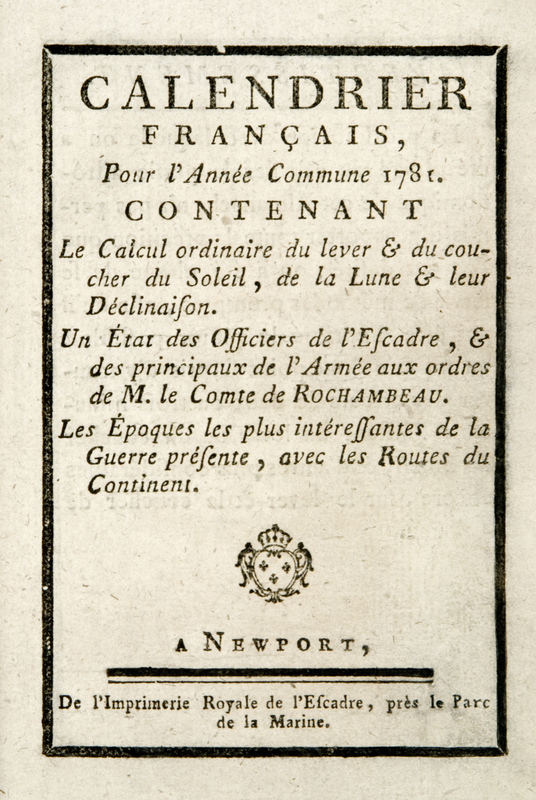 Published by the press of the French fleet upon its arrival in Newport, Rhode Island, this almanac provided a directory of the commanders of the French army and navy, a chart of distances from Newport to various cities and a chronology of the American conflict to date. This is the only known complete copy in an institutional collection. 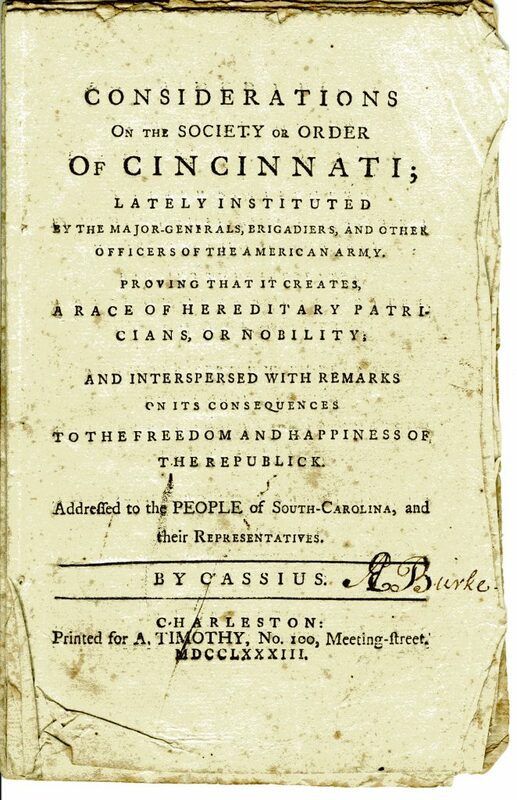 Within months of the establishment of the Society of the Cincinnati in May 1783, Judge Aedanus Burke of South Carolina published this attack on the organization, charging that it “creates a race of hereditary patricians, or nobility.” This is the first edition, published in Charleston, which was quickly followed by a second edition with a postscript addressing the South Carolina Society’s response. Editions of this work subsequently appeared in Philadelphia, Hartford, Paris and London, fueling a public debate on the merits and purpose of the Society. 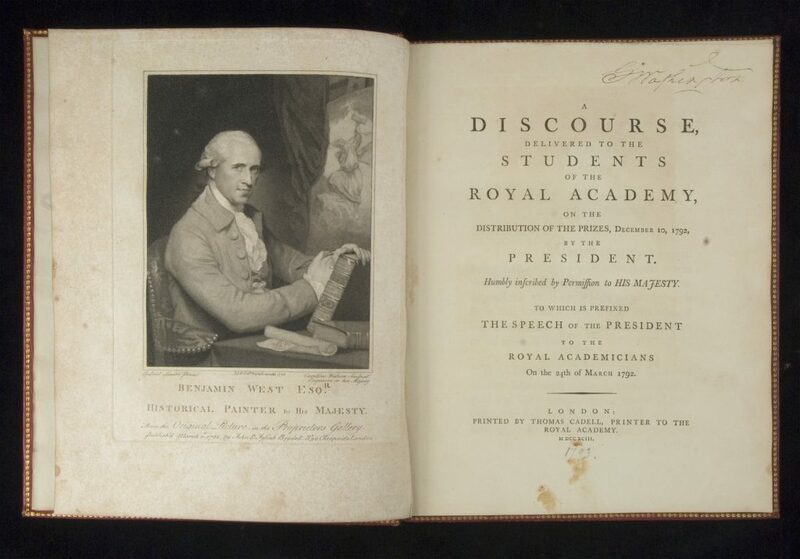 This volume is inscribed by the author to George Washington, and it bears Washington’s signature on the title page. The American-born artist Benjamin West became an official court painter to King George III, but he retained his allegiance to the cause of his native country through the Revolution. West particularly admired Washington, and Washington, in turn, admired West’s aesthetic ideas of meticulous realism. West co-founded, with Sir Joshua Reynolds, the Royal Academy of Arts, and West succeeded Reynolds as president of the Academy in 1792. Michel Gabriel Houdin, born in France, served in the Massachusetts Continental Line and became an original member of the Massachusetts Society of the Cincinnati. Among the hundreds of eulogies published on Washington’s death, Houdin’s pamphlet has the distinction of featuring as the frontispiece an engraved portrait of the author rather than of Washington. During the last years of his life, the comte de Rochambeau wrote a memoir of his long military career that spanned from the War of Austrian Succession to the Napoleonic era. It was not published until two years after his death. This copy belonged to Rochambeau’s son, Donatien, who was in prison in England at the time of its publication. It bears numerous annotations in his hand. 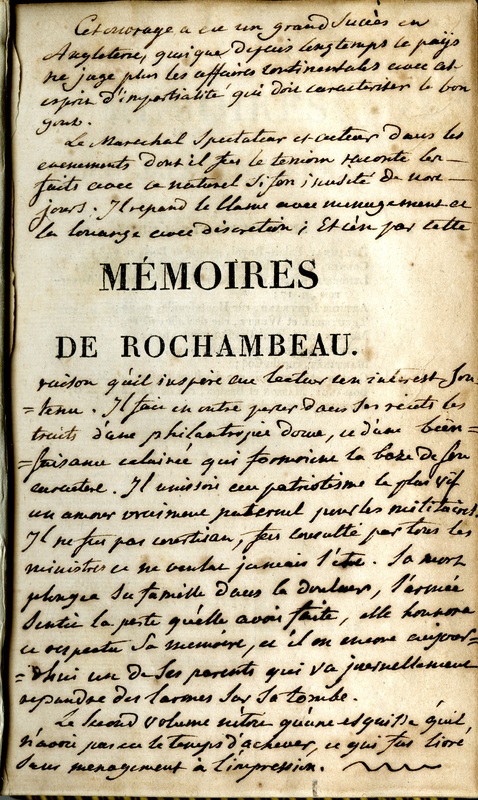 The Institute also holds in its collections the comte de Rochambeau’s original manuscript of this memoir.